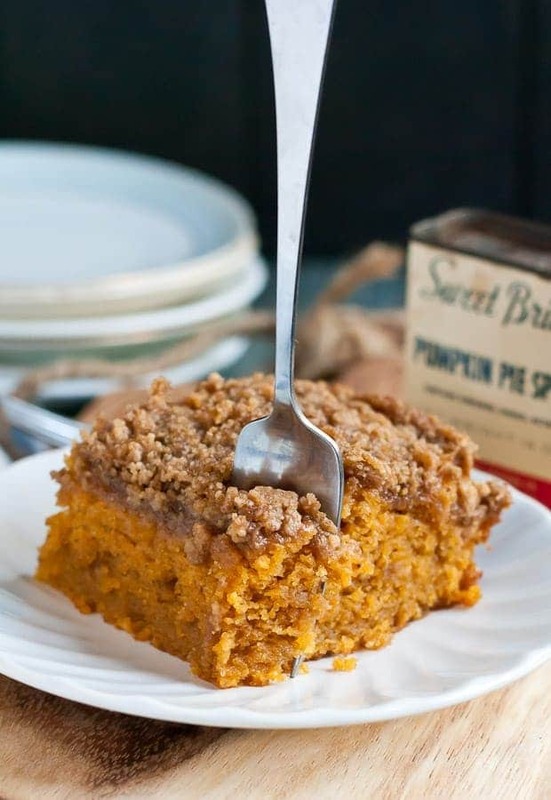 This Pumpkin Spice Crumb Cake with a buttery cinnamon and nutmeg topping is the best partner for your morning cup of coffee. You didn’t think I was going to let October pass without publishing a pumpkin recipe, did you? I mean, I’m not insane. The truth is, pumpkin and I were kind of on a break. I outpumpkined myself last year with Pumpkin Pinwheels and White Chocolate Pretzel Pumpkin Cookies and Pumpkin Dirt Pudding. I needed some space, some time to think and see other autumn fruits. But now I’m back, and I’m ready to give this relationship another go. Because honestly, I could never stay away for long. Those fall leaves and chilly mornings have me longing for those good old times with pumpkin. 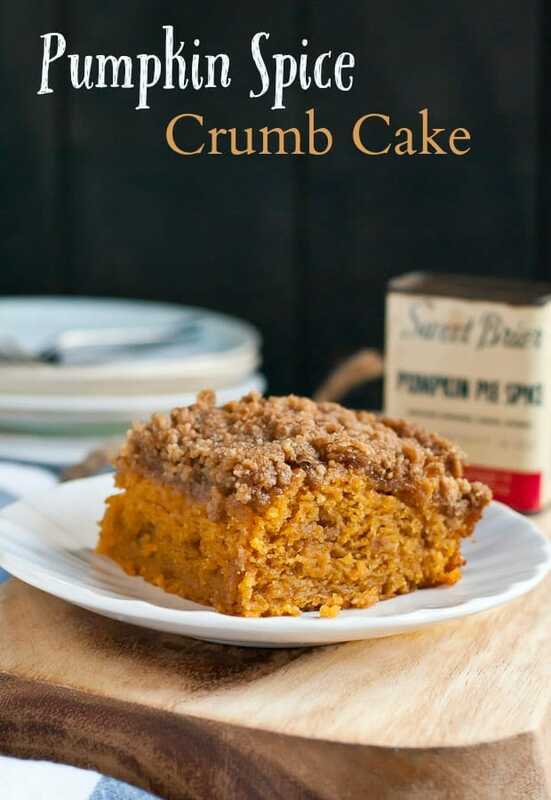 So I’m crawling back and begging forgiveness with this Pumpkin Spice Crumb Cake. If you ask me, there’s no better way to patch things up. This cake is deeee-lish. Buttery and moist on the inside, crispy and cinnamony on the outside. Spiced with nutmeg, ginger, and cloves, it’s got all the warm-you-up pumpkin spice flavor you need to start your day…or end it…or just get through it. Let’s be real, you’re going to be sneaking bites of this cake all.day.long. Can we talk about crumb topping for a minute? What dessert is not improved by a little crumb topping? If I have to choose between icing and crumb topping, I’m choosing crumb topping every time. This one is made with butter, brown sugar, cinnamon, and nutmeg and it adds just the right amount of crunch to this cake. But what makes this cake extra special is that the crumb topping is also inside the cake. That’s right, a layer of crumbs is baked right into the cake. It melts away during the baking process, leaving a trail of buttery brown sugar goodness behind. Magic. 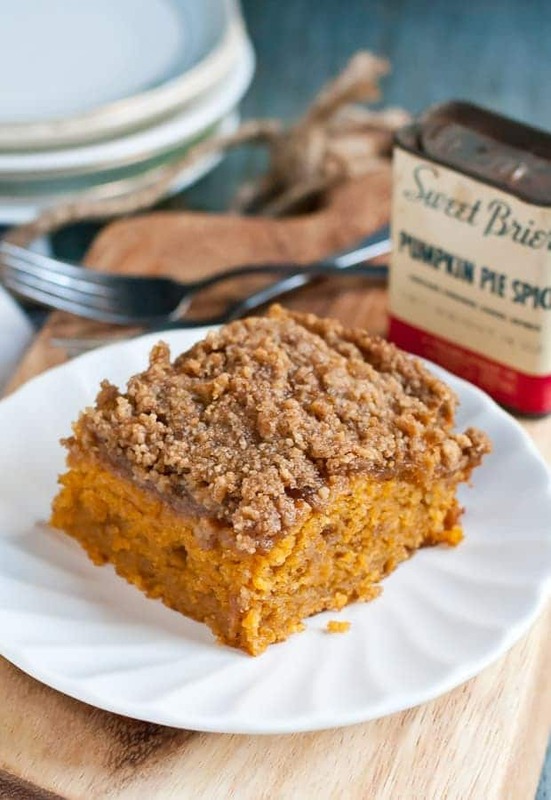 If you’re bored of pumpkin, reignite the flames with this Pumpkin Spice Crumb Cake. You’ll be back together in no time. And if you need even MORE pumpkin recipes to fuel your pumpkin spice craving, check out The Best Dessert Recipes Pumpkin Recipe Collection! Preheat the oven to 350 degrees and grease a 9 x 13 inch baking dish. In a large bowl, whisk together the flour, baking powder, salt, cinnamon, ginger, nutmeg, and cloves. In the bowl of an electric mixer, beat together the butter and pumpkin puree until well distributed. It's okay if it's not totally smooth. Add the sugar and beat until well combined. Beat in the eggs and vanilla. Add the flour mixture to the mixing bowl in three additions, alternating with the milk. Beat on low speed until no white remains. Set aside. To make the crumbs, combine all ingredients in a medium bowl and use your fingers or a pastry cutter to cut in the butter until it forms small crumbs. Pour half the pumpkin batter into the prepared dish. Layer with half the crumbs and then the remainder of the batter. Top with the rest of the crumbs. Bake for 45-55 minutes until a toothpick inserted in the center comes out clean. Made this tonight and it was delicious. Flavorful and moist – everyone loved it! We ate it piping hot and loved it.